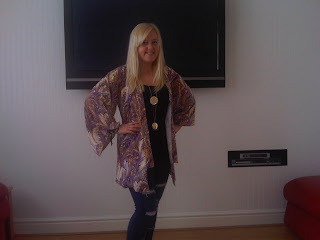 The first edition to my Winter Kate collection is a beautiful purple Psychedelic print Kimono jacket. The floaty 'Eden' jacket from Winter Kate is made from 100% natural vintage silk and it is very true to Nicole Richie's breezy bohemian style and now thanks to Winter Kate we can all steal Nicole's enviable style! Nicole Richie wears the yellow Winter Kate 'Eden' jacket. Head to ShopTheTrendBoutique.Com to shop Winter Kate by Nicole Richie. hey girl! you look AB FAB in your winter kate eden jacket!!! i love it too. i have the yellow eden jacket!! i think the eden jacket is the BEST item from the winter kate collection!! ps I want that necklace! I love the EDEN jacket its on my wish list for my birthday!! I make similar charm wraps to the disney one but obviuosly im much cheaper! !